This is my first post for Mamatography 2013 (a 365 day photography project). 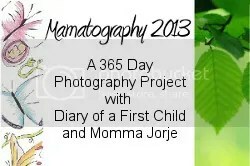 If you don’t know what I’m up to, check it out here… Mamatography 2013: A 365 Day Photography Project. Since I’m new to Mamatography, those of you participating probably don’t know much about me yet. In a nutshell, I’m the mom of a 5-year-old boy. I try to get out into nature (or at least outdoors) for playtime and discovery each and every day. The goal of my blog is to inspire others (parents and non-parents alike) to unplug, slow down, and head outdoors more often. If you’d like to learn more about me and why I started my blog, I recommend you head on over to my “About” page… anaturemom.com/about/. Here we go… week 1! January 3, 2013: We went on a train trip with my parents. Here’s my son, looking at the snow from inside the train. He’d never seen so much snow! To read more about this trip, see this post…. New Experience: Travel by Train. Oh, no… I didn’t take any photos today! And this was such a fun day. We had some great snowball fights which I would love to have taken some photos of, but, well, I was participating! January 6, 2013: Destruction of the gingerbread house using his Lego Spider Droid… it was fun to make, but perhaps even more fun to destroy. Here are the Mamatography 2013 participants! I enjoyed the photo of your son dwarfed by the dark trees. I love that spot, right where the meadow ends and the redwood forest begins. And I thought it was a new variant on an imaging test…..
Love, love, love! I love the idea behind your blog, get OUTSIDE, slow down… yeah, I need more time out in nature. I’d like my kids to have an appreciation for it, too. Don’t beat yourself up AT ALL for missing a day, it happens. And participating is definitely the more important thing! Awesome photos! And that forest.. oh my! I really look forward to all your pics out in the world this year! What a gorgeous boy! I’m so excited to be sharing this year with you. It’s always been really important to me to get my girls outdoors every day too – I don’t always succeed, but we try! Hopefully we’ll inspire each other. That would be great! Thanks again for hosting this fun project! Something to treasure in years to come. we don’t have cell phones…so I just always make sure I have my camera!